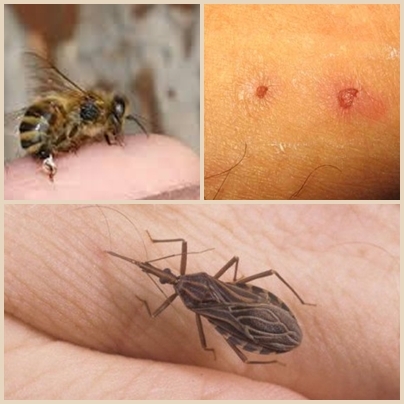 Herbal Medicine for Insect Bites - Bites or insect stings can cause several types of injuries, even cause poisoning, for example bite centipedes, spiders, ants and bees (wasps). If stung by an insect, which must be done is to clean the wound, issuing organ insects (stinger) is left in the skin, and neutralize poison insects. Ant bites are generally painless and redness of the skin and bring an allergic reaction. Spider bites cause pain and itching when stung. Several hours later arise tiny blisters on the skin and in the surrounding raised red spots. In people who are sensitive, often accompanied by dizziness, nausea, and vomiting. Bee stings cause a feeling of heat and pain. Up to 100 bee stings or more can lead to death. Bee stings should not be revoked because of the poison can be pushed into the skin. Perform massage the skin around the sting that poisonous stinger embedded in the skin can be removed. To reduce pain, compress with ice water. To prevent allergic reactions, give antihistamine pills. Fresh Andrographis paniculata (Sambiloto; ind) leaf sufficiently. Stick to the wound, then bandaged with gauze. Do it 2-3 times a day. Rinse and neem leaves, boiled with 400 cc of water to the boil. After boiled water cools, use water to compress the wound. Do it three times a day. Rinse all ingredients and blend. Stick it on the skin that sting and bandaged with gauze. Do it 2-3 times a day. Garlic puree, paste on insect bite wound. Do it three times a day. Rinse all the ingredients, boiled with 600 cc of water until the remaining 300 cc, then strain. Hopefully the information about Herbal Medicine for Insect Bites, which we write in this blog can be beneficial to you.